I don't remember where I first saw this album cover (it must have been online), but it's one of my all-time favorites. What an expertly executed composition of imagery, color and font! Not more than a couple of months ago I was sifting through the many albums in the used section and...there it was! Do you know that feeling? Your heart starts beating fast. You calmly and quickly set the record aside so as not to attract attention. You are well on your way to becoming a vinyl junkie! So I get this home, clean it up and here it is. I must confess, the content is not nearly as dark and sinister as I was hoping for but it still entertains in a spook-tacular way! Upon "Googling" Arch Oboler, it turns out that he enjoyed a successful career in radio as well as writing for stage and screen. One of broadcasting's top talents, he is regarded today as one of the innovators of old time radio. Technical Notes: This record was cleaned with a Nitty Gritty and transferred directly through a Radial J-33 phono pre-amp to an M-Audio Firewire 410 soundcard. A sensible amount of noise reduction was used to eliminate, erradicate and exfoliate those pesky crackles and pops, greatly improving the overall sound. 192kbps. Wait--you just found out Arch Obler was a radio guy? It wasn't long ago I discovered he'd done tv! Cool, I did not know that this existed. 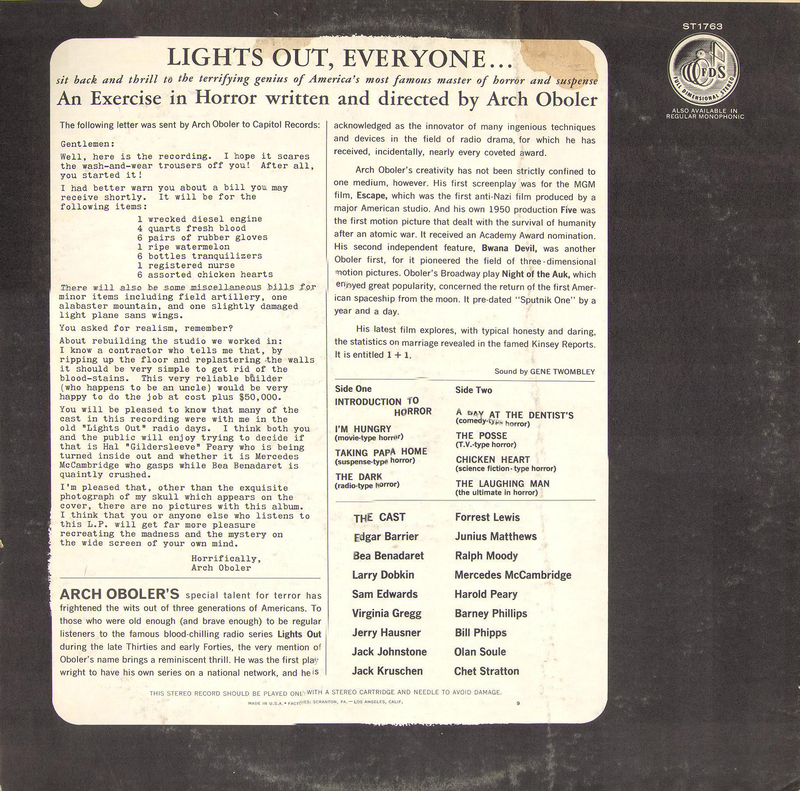 Arch Obler's radio stuff is readily available on the net - www.archive.org has most of 'Lights Out' and some of his other shows. Lights Out was about as good as it got when it came to radio 'horror' but a disclaimer is in order here - 'horror' then is much different than horror now. this record is going into my halloween file for sure, thanks for the post spaceboy!!! YES Adam, horror is much different now. From the looks of the cover, I was expecting something far more spooky. This is almost 'cute' by my standards! But hey, I'm glad you guys like it. Thanks for the comments. 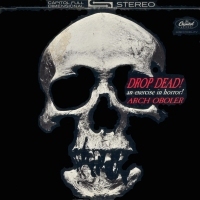 I think that same skull has been used for other LP covers as well, stock photo? Great stuff, spaceboy. Nice bit rate too, man. Yeah, Lights Out was terrific. Spaceboy, if you're interested in classic era radio horror, head over to my one-pager for links to many classic episodes, and links to these series: The Black Mass, Dark Fantasy, The Devil and Mr. O (another Lights Out relaunch, like Drop Dead), The Hall of Fantasy, The Hermit's Cave (great host! ), Price of Fear (Vincent Price's horror show), The Strange Dr. Weird and The Weird Circle. Thanks again for Drop Dead! I'd never heard it and you did a really nice job cleaning it up. Here's to ya! Track 7 contains the original story that Bill Cosby talks about in his famous Chicken Heart comedy routine. Finally got this last Halloween after years of hearing about it - especially in Stephen King's hyperbolic "dissection" (ho-ho) of horror, Danse Macabre. It wasn't as good as I'd imagined it (or as Steve-O made out), but some of the tracks are fantastic, particularly "Introduction" and "The Dark", which work best if you have an over-active imagination and are listening on your own in the dark. The rest are like weird Twilight Zone episodes and what's all that business with the train meant to be? I think a lot of the material is for playing on your fabulous new stereo system after your swish intellectual dinner party. Can't wait to hear Johnny Got His Gun! I still have the LP I bought in the early 70s. The Dark was quite frightening to me then, and I'm Hungry was pretty shocking. I made a copy for my 10-year old son but am reluctant to give it to him yet. Oh, c'mon boil! I'm sure you're son has heard far more terrifying things on top 40 radio. Have you heard of Britney Spears? What about Jack Johnson or Hootie & the Blowfish? If he's not already scarred for life, I'm sure he'll be fine. I had a battered copy of this record when I was a kid and I absolutely LOVED it! Did you listen to The Ultimate Horror? He jokes about dropping bombs on children. I know my previous post didn't allude to that, but this LP is pretty effin disturgon, i.e., , disturbin. Thank you so much! I listened to this album as a horror-fan kid and loved it! Was sitting at my desk, wishing I could hear these stories again. "The Dark" is totally creepy! boil, yeah, the last track you're referring to. i've only heard it a couple times (so far) but as i remember it, it also makes an important point. in fact, i believe it's the only piece with a message...how ridiculous it is for mankind to fight. norabelle, curt, evil pain clown, digital earl...thanks again to everyone for all the great feedback! halloween is my favorite time of year and you all are like the ghosts and goblins i never had! We had this record when I was a kid. I had such fond memories of it that I finally bought a copy on ebay. Wonderful stuff! Can we download/purchase 365 Days #300 - Arch Oboler - Drop Dead! (mp3s)? In 1982, I lost an lp of this identical playlist. Yellow cover; original Arch Obeler "best of" type release. I'm just about to listen to The Chicken Heart and The Dark for the first time in almost 30 years. I'm sure they'll seem a bit hokey, but my brain is salivating nonetheless. Friend of mine has original 19 rpm transcription discs (The Shadow, Superman)he rescued from a radio station he worked at as a teenager in the 1950's. They were melting them down for petroleum product! Thanks for removing them AFTER I got them!! The writing is far ahead of what passes nowadays. The Laughing man is exceptional. Thanks for restoring a missing piece of the puzzle I call my life. Great comment about the "Terrifying Top 40!!"